Note: Rice grains should be separate when cooked. Before cooking the rice use bit less water than the usual measurement. Cooked rice should be at room temperature before using to avoid lumps. Add curry leaves and green chilly. Add groundnuts, saute for few second. Add cashew nuts saute till it gets slightly roasted. Add onion and 1/2 tsp salt saute till onion gets slightly golden brown. Add turmeric and salt to taste, mix. Add cooked rice, mix gently for few seconds. Lemon Rice / Chitranna is ready to serve. new to ur space and happy to follow u for more wonderful recipes..
always a yummy one!.....nice recipe! Addition of onion is a new twist - looks delicious! 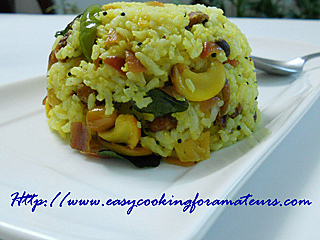 Lovely rice....I love the slight tangy taste and the sweet light colour...Looks yumm dear..
My fav- looks perfectly done! The rice looks so deliiiiiiiiiiicious!